The Original, Stuffable Treat Dispensing Toy! One of the most popular dog toys for over thirty years. Super-bouncy, durable natural rubber compound is perfect for typical chewers. Tough and bouncy. Measures 5 inches by 3 1/2 inches. Mainly for dogs 60 to 90 pounds. "This is a wonderful product that I can safely leave with my puppy when I'm away." 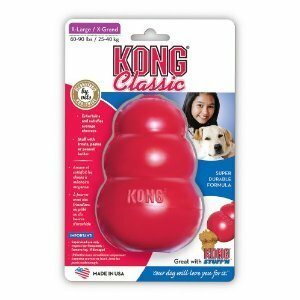 Thank you for stopping by our Dog KONG Toys: KONG Classic page!